From the Academy Award®-winning creators of Finding Nemo (2003 Best Animated Feature Film) comes the action-packed animated adventure about the mundane and incredible lives of a house full of superheroes. Bob Parr and his wife Helen used to be among the world's greatest crime fighters, saving lives and battling evil on a daily basis. 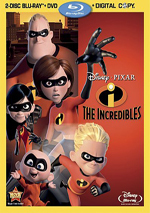 Fifteen years later, they have been forced to adopt civilian identities and retreat to the suburbs where they live "normal" lives with their three kids, Violet, Dash, and Jack-Jack. Itching to get back into action, Bob gets his chance when a mysterious communication summons him to a remote island for a top secret assignment. But he soon discovers that it will take a super family effort to rescue the world from total destruction. $70.467 million on 3933 screens. With 2004’s The Incredibles, Pixar embraces superheroes – and does so in splendid fashion. Given the movie’s success – and Pixar’s willingness to create franchises – it’s a bit of a surprise we’ve not gotten Incredibles 2, but perhaps one will eventually continue the fun. The film launches with some quick interview snippets with superheroes Mr. Incredible (voiced by Craig T. Nelson), Elastigirl (Holly Hunter) and Frozone (Samuel L. Jackson) as they discuss the ups and downs of their work. From there we watch Mr. Incredible handle some cases on the way to an appointment. He gets pestered by adolescent Buddy (Jason Lee), who aspires to be Mr. Incredible’s sidekick IncrediBoy. That factor causes problems when Incredible battle the villainous Bomb Voyage (Dominique Lewis). Buddy pops up in the middle and almost gets taken out by a bomb. Incredible saves him but other problems arise, and he dismisses the boy despite Buddy’s talent as an inventor. Once Incredible disposes of this problem, we see the appointment he needed to make: his own wedding. In his secret identity as Bob Parr, he marries Helen, aka Elastigirl. Unfortunately, their dual lives soon take a turn for the worse. Incredible caught a suicidal jumper in midair and got sued for his action. Other superhero lawsuits follow and the public protests against the powerful crusaders. This leads the government to initiate the Superhero Relocation Program. Via it, the heroes will get amnesty for the prior work but can’t ever use their powers again. The film then jumps 15 years ahead and we meet Bob as a fat, middle-aged insurance claims adjuster. Helen stays home as a housewife with their three kids: introverted middle schooler Violet (Sarah Vowell), rowdy fourth grader Dash (Spencer Fox), and baby Jack-Jack. Bob hates his job, largely due to his nasty boss Mr. Huph (Wallace Shawn). In the meantime, Dash gets in trouble at school for his rambunctious behavior and feels frustrated because he can’t take advantage of his superpowers. Dash can run extremely quickly, but his parents won’t let him go out for sports because they worry the competitive Dash will reveal his abilities. Violet pines for classmate Tony Rydinger (Michael Bird) but she’s too shy to do anything about it, and she uses her power to turn invisible to avoid him. Bob clearly hates his ordinary existence, so he finds an outlet. Along with pal Lucius - the former Frozone - he goes out weekly to surreptitiously do some good. This causes arguments with Helen and also attracts the attention of Mirage (Elizabeth Pena), apparently a representative for a powerful secret branch of the government that tests new technologies. When he assaults Mr. Huph and loses his job, Bob finds a high-tech message from Mirage who says her group needs his help to stop an out-of-control device called the Omnidroid. Bob takes the job but doesn’t tell Helen about it. He manages to take down the Omnidroid and continues to perform other tasks for the group. This leads to a lot more pep in his step, as he gets into shape and feels much better about himself. Inevitably, problems arise. Helen becomes suspicious, and Bob eventually discovers the identity of his benefactor. It turns out to be a villainous sort named Syndrome, and this character comes from Incredible’s past. Syndrome captures Incredible, so Elastigirl has to come out of retirement to save him. Against her wishes, her superpowered kids come along to help, and the rest of the movie follows the rescue attempts along with their bid to stop Syndrome. When I saw Incredibles theatrically, I can’t say it dazzled me. I enjoyed it but couldn’t figure out why it earned so many rave reviews. To me, it continued Pixar’s post-Toy Story 2 path. I loved the studio’s first three flicks: 1995’s Toy Story, 1998’s A Bug’s Life and Toy Story 2. On the other hand, I simply liked Monsters Inc. and Finding Nemo. I thought they offered perfectly enjoyable movies but lacked the spark of genius I saw in the first three Pixar films, and additional screenings didn’t convince me otherwise. The same didn’t hold true for Incredibles. Again, I liked it theatrically but didn’t regard it as particularly memorable. However, my opinion changed considerably when I watched it a second time on DVD. While I’m still not sure it compares with the near-perfection of the first three Pixars, it comes much closer than I originally believed. Key to the success of The Incredibles is its emotional impact. Pixar always manages to give its flicks a heart that the others lack. Competing studios work too hard to pack their flicks with glib humor and cultural references, but they forget to try to make characters and stories with more than a modest reason for us to care. Take Shark Tale, for example. The movie offers a fair amount of funny moments and becomes reasonably entertaining, but it never elevates above the level of one-dimensional characterizations. We have a few laughs and forget about the flick as soon as it ends. That’s not the case with the Pixar flicks, and Incredibles falls into line. The decision to show us the family of the superhero is a stroke of genius, especially since the movie doesn’t simply play the scenarios for laughs. Lesser moviemakers would have just used the set-up as an opportunity to pour on cheap gags, but that doesn’t happen here. This means Incredibles features a surprising range of styles and emotions. It works on many different levels. On one hand, we can take it as a broad spoof of both superhero conventions as well as Bond flicks. Indeed, despite its comic book-style characters, Incredibles often has a lot more in common with Bond efforts. For sure, it takes its stylistic cues from that camp, as the movie’s Sixties look and sound feels like they come straight from pictures like Thunderball or Goldfinger. Heck, Michael Giacchino’s score sounds as though John Barry wrote it! But Incredibles broadens well beyond simple spy/superhero parody with its other notions. The examination of the superhero family is clever and also a nod to the Sixties via Marvel’s “Silver Age” in which they made their new heroes like Spider-Man and the Fantastic Four more human than their predecessors. Incredibles doesn’t use the family elements as a gimmick, however. It plays much of that side of things semi-straight, which gives it a considerable impact. The movie doesn’t develop all the personalities equally - really, Violet and Dash get very little exposition - but it provides enough for us to invest in them and worry about them. Do we truly believe the movie will kill off any of them? No, but it puts them in enough danger to make us concerned. This also gives the film a warmth and depth it easily could have lacked. There’s a naturalism to the interactions that gives the story range, and it also loses the simple moralizing of most animated films. Yeah, it gets into “be true to yourself” or some such notion, but it never beats us over the head with its concepts. Even if you ignore the character interactions and emotional dimensions, you’ll probably enjoy Incredibles as a straight action romp. The movie’s first half seems a little light on those segments, but the rest of the flick pours on plenty of great sequences. The attack on Helen’s plane is a real nail-biter, and the climactic battle in the streets also makes a mark. In between we find many exciting and fun bits like the one in which Dash finally gets to let loose. The movie gleefully conveys his exhilaration as well as his fear in this terrific segment. Of course, Incredibles tosses in plenty of low-key humor as well. This isn’t a broad belly-buster of a movie, and that’s more than fine with me. Instead, it gets most of its laughs from fairly subtle gags, and that makes them more endearing than the usual wild antics. We find clever, creative moments like the one in which Elastigirl infiltrates Syndrome’s compound and becomes stuck in three different doors; it’s tense and funny at the same time. I also like the quirky touches like the drinking game created by Syndrome’s henchmen: when someone shoots at the Omnidroid, they down a shot. Some of these jokes fall in the “blink and you’ll miss them” category, but things like that make additional screenings of the flick worthwhile. It seems likely that you’ll pick up on previously missed nuances with each new viewing. Not everything about Incredibles soars. I’m not wild about the pacing, as it loses track of some story elements for too long. Frozone vanishes for a considerable period, and that comes as a disappointment as he’s a cool character (no pun intended). As I already noted, the kids don’t get a lot of elaboration either, and they occasionally become lost in the shuffle. Ultimately, these minor complaints don’t mean much, though. There’s simply too much to love about The Incredibles for me to fret over some minor quibbles. A consistently warm, rich and inventive movie, it works on almost every level. The Incredibles appears in an aspect ratio of approximately 2.39:1 on this Blu-ray Disc. I expect virtual perfection from Pixar releases, and that’s what I got here. At no point did sharpness appear anything other than stellar. Even in the widest shots, the image remained tight and rock-solid. I never noticed a hint of softness in this tight, detailed presentation. In addition, no concerns with jagged edges or shimmering popped up, and I saw no signs of edge enhancement. As with all the other Pixar flicks, this transfer came straight from the digital source, so it lacked any form of distracting defects. With its stylized Sixties look, Incredibles presented a broad palette, and the disc replicated those hues wonderfully. It veered from bright, warm tones to quieter, more subdued colors with ease and made all of them look vivid and distinctive. Blacks were deep and dense, and the shadows - of which we got more than usual for an animated movie - seemed smooth and accurately rendered. I’ve come to anticipate excellent visuals from Pixar Blu-rays, and this one lived up to expectations. Incredibles offered one of the best of the Pixar soundtracks since the DTS-HD MA 5.1 mix boasted such lively material. With all the superhero action, the movie had many chances to make great use of the five channels, and it lived up to those expectations. At all times, the movie created a good sense of environment and utilized the different speakers to its advantage. Elements were well-placed and blended smoothly, and that included liberal use of localized speech; voices came from logical spots in the spectrum. Music also presented nice stereo imaging. Of course, the action sequences were the most memorable. From start to finish, those helped place us in the world of the heroes, as the battles and destruction came from all around us. For possibly the most fun pieces, look at those in which Dash runs around the room. Others also came across as winning and involving too, and they helped make the mix very involving. Audio quality kept up with the high standards of the rest of the package. Speech always sounded natural and warm, with no edginess or intelligibility issues. The brassy score was bright and vivid, as the track punched the music well. Effects finished things with accurate, dynamic audio that represented the elements in a lively manner. Bass response remained consistently deep and firm, as the low-end added solid punch to the track. The audio wasn’t quite good enough to match with the picture’s “A+”, but it definitely merited a straight “A”. How did the picture and sound of this Blu-Ray compare with those of the original 2005 DVD? That release was excellent, but the Blu-ray was better. Audio offered a bit more clarity and pop, and the visuals showed stronger tightness and definition along with livelier hues. The DVD looked great for its format, but it couldn’t compare with the near flawless Blu-ray. The Blu-ray provides the same extras as the DVD along with some new ones. I’ll note Blu-ray exclusives with special blue print. On Disc One, we open with two separate audio commentaries. The first comes from director Brad Bird and producer John Walker, both of whom sit together for this running, screen-specific track. Recorded almost exactly two months before the movie opened, Bird and Walker didn’t know how it’d be received, but that didn’t stop them from providing a peppy and optimistic look at their film. Bird dominates as the pair discuss a mix of production issues. We get notes about story and character concerns, cut and altered scenes, influences and inspirations, technical challenges and general comments about the movie’s creation. On the negative side, some of the time the pair just praise the folks who worked on the movie. However, we still find much insight into the various processes, and Bird comes across as passionate about his work. Amusingly, he threatens to punch the next person who refers to animation as a “genre” and he clearly really gets into his job. The surfeit of praise keeps this from becoming a great commentary, but it presents more than enough information to satisfy. For the second commentary, we hear from supervising animators Tony Fucile, Steven Hunter and Alan Barillaro plus animators Gini Cruz Santos, Dave Devan, Kureha Yokoo, Dave Mullins, John Kahrs, Robert Russ, Angus MacLane, Travis Hathaway, Doug Frankel, and Peter Sohn. All of them sit together for this running, screen-specific track. With such a huge roster of participants, it becomes tough to keep score. I can’t be sure, but it sounds like the three supervising animators sit together for their parts while the other animators are with each other for theirs. Whatever the alignment may be, the commentary edits together neatly and works well. As one might expect, it focuses mainly on technical animation concerns. A particular focus looks at all the animators who came from the world of cel work and the challenges they faced as they moved to CG and its three dimensions. We also find nice notes about character design and the work of the voice actors, visual problems and inspirations, story issues, working with Bird, the movie’s look, and general technical topics. Some of the more intriguing remarks go into actors considered to play Mr. Incredible; names like George Clooney and Harrison Ford appear. I also like the information about how the Rankin-Bass “animagic” shows influenced their work, and a lot of affectionate mockery of Bird’s intense style gives the track humor and life. The commentary moves briskly and gives us a solid examination of the animation processes. Two shorts appear here. Boundin’ accompanied theatrical screenings of Incredibles. The four-minute and 41-second cartoon depicts a lamb with a glorious coat who loses his sense of self when a farmer shears his wool. It’s a cutesy short that doesn’t do much for me, perhaps because the western motif presents some annoying music. We can watch the short with or without commentary from writer/director/narrator Bud Luckey. He discusses visual influences, his own background, story and character inspirations, music and technical elements. It’s fun to hear all the cannibalized parts of the cartoon, as Luckey mentions that he used a vehicle from Cars and a character from Nemo. Luckey presents a quick but informative chat. Originally created for the movie’s DVD, the animated short Jack-Jack Attack goes for four minutes, 43 seconds. It follows what happened to Kari the babysitter while the family was off battling Syndrome. It’s a highly entertaining piece. We get a visual commentary for the short via the four-minute, 43-second Jack-Jack Attack Exploded. It includes info from Bird, story supervisor Mark Andrews, character designer Teddy Newton and animator/voice actor Bret Parker. They tell us about the short’s origins and aspects of its story, creation and performances. The visual side of things shows related photos, storyboards, concept art and connected video. We find a ton of info across this brief reel; it’s a delight. The Incredibles Revisited runs 22 minutes, six seconds and provides a roundtable discussion with Bird, Walker, Andrews, Fucile, Newton, production designer Lou Romano and supervising technical director Rick Sayre. They chat about resistance from some of the Disney suits, early story and character development, animation challenges, and various anecdotes about the flick’s creation. I worried that the conversation would replicate a lot from the commentaries, but it doesn’t. Instead, it offers a fresh, lively view of the film. Disc One launches with ads for Cars 2 and The Lion King. These also appear under Sneak Peeks along with a promo for Disney parks. With that we head to Disc Two – and a component that would’ve made more sense on Disc One: Who Is Bud Luckey? 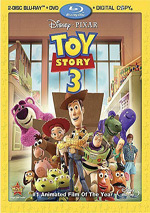 The three-minute and 56-second featurette presents comments from Luckey, Bird, executive producer John Lasseter, Monsters Inc. director Pete Docter, and Pixar president Ed Catmull. They let us know about Luckey’s career and his work on “Boundin’”. A little of the information related to the short repeats from Luckey’s commentary, but we get nice insight into the animator and his other work. Six deleted scenes pop up next. Including introductions, these fill a total of 34 minutes and 33 seconds. The longest and most significant of these is the “Alternate Opening”. It would have started the movie with a different tone and it would have altered the ending as well; some of the material from the actual conclusion shows up in the “Alternate Opening”. We also see a deleted character - Snug, Helen’s old pilot - and a few smaller bits that didn’t make the cut. None of them come in animated form; they’re all storyreels that consist of storyboards and audio. Despite that, they’re a lot of fun to see. The inclusion of introductions and other discussion from Bird and story supervisor Mark Andrews helps make this area more interesting. Bird does the majority of the talking as he gives us notes on where the scenes would have gone in the movie, what he liked and disliked about them, and why they were cut. The material gives us lots of fine facts. Next comes a 27-minute and 23-second documentary called The Making of The Incredibles. It consists of movie clips, behind the scenes bits, and interviews. We hear from Bird, Lasseter, Walker, Kahrs, Sohn, Barillaro, Hunter, MacLane, Fucile, Andrews, editor Stephen Schaffer, co-director of photography Andrew Jimenez, character designer Teddy Newton, production designer Lou Romano, animators Bret Parker and Jim Murphy, character technical artist Mark Therrell, art director Ralph Eggleston, production manager Katherine Sarafian, composer Michael Giacchino, sets sequence supervisor Nigel Hardwidge, character supervisor Bill Wise, and supervising technical director Rick Sayre. A wide variety of subjects are covered here. The program goes into Bird’s strong personality and how he came to Pixar from the 2-D world, origins of the film and its development, character decisions, moving from 2-D to 3-D, the score, approaches to the animation, the three supervising animators, videotapes of the animators as they work out acting, technical specifics, challenges connected to the rendering of humans, the emphasis on stories and depth at Pixar, elements of Bird in various characters, battles between Bird and producer Walker and various changes. What you won’t find in “Making”: a clear, concise part “A” to part “B” synopsis of the production. While it starts with Day One - literally - of Bird’s tenure at Pixar plus the origins of the project, it soon hops around the various aspects of the movie’s creation. What you will find: a lot of good insight into the film and its participants. Some of the usual happy talk pops up, but we also get more than a few frank moments. More than a few arguments pop up due to Bird’s passionate personality, and we see them in all their glory. Behind the scenes footage acts as the star of this piece. Some of the information offered already appears in the commentaries, but the inclusion of the video shots from the workrooms adds a lot of spark here. Plenty of new material appears as well, and we get solid details about a number of issues. I admit I’d have preferred a more logically delineated documentary, but this one nonetheless fills out the subjects well. Additional information crops up via a collection of clips originally listed under More Making of The Incredibles. The Blu-ray splits them up into “Story” (7:15), “Character Design” (5:30), “E Volution” (2:45), “Building Humans” (6:17), “Building Extras” (2:00), “Set Design” (2:00), “Sound” (3:13), “Music” (5:15), “Lighting” (3:00) and “Tools” (2:39). Here we find notes from Bird, Andrews, Walker, Schaffer, Jimenez, Romano, Eggleston, Newton, Fucile, Sayre, Wise, Therrell, Giacchino, Hunter, Mullins, shading art director Bryn Imagire, cloth development lead Christine Waggoner, hair and cloth simulation supervisor Mark Thomas Henne, software team lead Andy Witkin, technical artist Bill Sheffler, musician Rick Baptist and Clayton Haslop, conductor/orchestrator Tim Simonec, recording engineer Dan Wallin, director of photography Janet Lucroy, software team leads Karon Weber and Tom Hahn, and sound designer Randy Thom. A more intentionally fragmented program, this one goes through a number of topics. It gets into story development and fitting unique sequences together, story pitches and animatics, character design, specifics about “E”, making humans both realistic and stylized, problems with clothing, hair and muscles, creating digital extras with “Universal Man”, the film’s many sets and environment, sound design and music, lighting, and software tools. Oddly, though this collection of clips doesn’t try to blend them together, it flows better than the main “Making” show. The latter’s shifts feel more awkward because they come without natural pauses, whereas “More” clearly stops and starts its snippets. Both provide similarly useful information. “More” digs into quite a few tasty topics and really helps flesh out our understanding of the flick. It repeats little from the commentaries as it goes over many neat subjects and gives us a lot of insight. An unusual piece, Vowellet - An Essay By Sarah Vowell consists of a kind of video diary created by the voice actor. In this nine-minute and 24-second piece, she chats about her real life as a historical writer and other facets of her personality. She also discusses her work on the film, and we see some outtakes from Incredibles plus a test reel for Violet. It’s a funny and intriguing look at the person behind the voice that becomes more interesting since acting isn’t her focus. Info about staff members pops up during Paths to Pixar – Story Artists. The five-minute, 55-second piece features story artists Mark Andrews, Kevin O’Brien, Andrew Jimenez, Ted Mathot, Teddy Newton, Valerie LaPointe, and Peter Sohn. They tell us a little about their work and how they ended up as story editors. This isn’t the disc’s most fascinating piece, but it fleshes out the various roles in a decent manner. Studio Stories: Gary’s Birthday runs one minute, 24 seconds. It offers a tale from Bird and Walker and combines crude animation with an anecdote about how the fictional “Gary” would become a morale booster during the shoot. It’s another fun piece. During the one-minute, 35-second Ending With a Bang: Making the End Credits, we hear from Jimenez and Newton. They tell us a little about the visual design of the closing text. Nothing scintillating appears, but we get a few nice notes. Something just for fun comes with The New Nomanisan: A Top Secret Redevelopment Plan. This area provides fake ad for the reinvention of Syndrome’s base as a resort; after the introductory promo, we get clips that tour 10 sections of the island. It’s cute but insubstantial. Within the Art Gallery, we go into six different areas. The domain includes “Storyboards” (6 frames), “Character Design” (11), “Set Design” (5), “Color Scripts” (5), “Lighting” (13) and “Collages” (9). Compared to other Disney releases, this section doesn’t include as many stills as usual, but they’re all quite good. They offer a solid examination of the visual elements used to create the flick. Quite a few ads appear. The teaser - complete with footage not meant for the movie – comes in high-def; two standard-def trailers also show up here. “Publicity” tosses in six very brief ABC Stunts snippets; I guess these ran as bumpers on the ABC Network. Three additional commercials can be found; they use the movie’s characters to promote Tide and SBC. ”Publicity” also gives us six minutes and 31 seconds of Character Interviews. This puts Mr. Incredible in a situation with KABC TV’s George Pennacchio, Elastigirl with Access Hollywood’s Nancy O’Dell, Extra’s Jerry Penacoli with Frozone, and E!’s Patrick Stinson with Edna. The original actors supply the voices, but they don’t make this anything more than a cute trifle. After this we find a fabricated kiddie cartoon show named Mr. Incredible and Pals. We see a four-minute and two-second clip in which Mr. Incredible and Frozone work with Mr. Skipperdoo, a bespectacled rabbit. It’s appropriately crappy and also very entertaining, partially due to its short length; it’d get old if it lasted much longer. We can watch “Pals” with or without commentary from Mr. Incredible and Frozone. Voiced by Nelson and Jackson, they bicker about the quality of the program; Frozone hates it while Incredible defends the program. It’s quite good and might be funnier than the show itself. NSA Files presents information about 21 superheroes and also gives notes about three superhero groups. Not only does the section show text details about the heroes’ powers and personalities, but also sound bites appear in which the heroes chat about themselves. This becomes a cool and creative extra that’s a lot of fun, especially the audio clips; those are tremendous fun, and they demonstrate that the folks behind this area put a lot of effort into it. Under Easter Eggs, we locate 11 short pieces that run a total of 14 minutes, five seconds. We find elements like a sock-puppet version of the film, animation outtakes/bloopers and unused storyboards, a run-through of the movie’s buttons and doors, the involvement of animation legends Frank Thomas and Ollie Johnston, and some random silliness. These mix wheat and chaff, but they’re usually enjoyable. 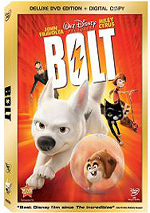 A third disc offers a Digital Copy of the movie. This allows you to transfer the film to a computer or portable gadget. Flippy! Finally, a fourth platter provides a DVD Copy of Incredibles. If you want to own Incredibles but aren’t yet Blu-ray capable – or if you just want one to tote in the car - it’s a good bonus. 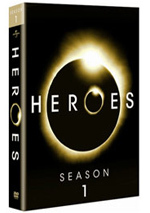 Well, if you don’t already have the old DVD from 2005; if you have that, it’s kind of pointless, especially since it drops that disc’s commentaries. The Incredibles soars. It combines parody with homage to create a warm, witty, exciting and very endearing action flick. Unsurprisingly, the Blu-ray provides virtually flawless picture quality as well as excellent audio and supplements. The Blu-ray creates a stellar rendition of a terrific movie; it’s well worth your attention and is a fine upgrade over the old DVD.